— Roman Civil Code in the sixth century A.D., (The Justinian Institutes: legal texts). The ancient laws of the Byzantine (Roman Empire) Emperor Justinian stipulated that the shorelines that were not appropriated for private use were open to all. Under this legal concept of common property, the tide and submerged lands were unique: it was thus impossible to hold private ownership over the air, rivers, sea and the seashore; they were dedicated to the use of the public, and the state was to hold them “in trust” for the people. Thus, common property could be owned by no one, affording all citizens access to it. Through the Magna Carta (1215: the “Great Charter of Freedoms”) public rights were further strengthened at the insistence of the nobles (the privileged social classes) that lowhead dams which obstructed free navigation be removed from rivers. Changes in English common law enacted in 1641, and additional modifications enacted by Colonial Ordinance in 1647, owed to English disfavor for “ownerless property,” and Roman law was expressed by assigning ownership of common property to the king: not for his private use, but as a trustee of these properties for the benefit of the people. The concept of common easements for public navigation and fishing was introduced, with an understanding that the Crown owned submerged lands and shorelines in trust for the people. This reinforced the concept within the public trust doctrine that government (the sovereign) cannot own but has an affirmative duty to administer, protect, manage and conserve fish and wildlife; and further, government cannot turn that responsibility over to another. This re-affirmed that a state’s title to its waterways and tidelands was different from that to the lands it may hold for sale (commit to private purposes), as it must be managed to protect the “common heritage” of its people (see: Henquinet & Dobson, 2006). Hence, government cannot relinquish its obligations to a popular vote to establish administrative management, protection, and conservation practices for renewable wildlife and marine resources. Put differently, ballot measures cannot supersede governmental (sovereign) rule (see also: Illinois Central Railroad case, below). Common law incorporates "stare decisis"
England adopted the Public Trust Doctrine as common law, and the French Civil Code and Spanish civil law both subsequently acknowledged the concept of common property. In turn, the Public Trust Doctrine was imported into the 13 original U.S. colonies, and upon their independence, potentially became part of the fundamental law in each state. After the American Revolution, each of the original states succeeded to this sovereign right and duty: each thus became trustee of the tidelands within its borders for the common use of its people. In so doing the American courts abolished the English system of royal prerogatives and reestablished and strengthened the full public trust concept. In 1821, the NJ Supreme Court revisited public trust law closer to the original Roman concept in deciding Arnold v. Mundy, by stating that the ownership of water and underlying lands transferred to NJ citizens upon statehood. The Public Trust Doctrine remains valid today as common law in jurisdictions where its principles have been enacted in statutory laws and ordinances to manage subject waters and lands. The first federal court decision affirming the doctrine was Martin v. Waddell in 1842 (41 U.S. 16 Pet. 367 367), finding that the public held a common right to fish in navigable and tidal waters of New Jersey because they and their underlying lands were owned by the state for the common use by the people. The Supreme Court ruled that the Magna Carta had settled the question of who owns fish and wildlife and that King Charles II did not have the authority to give away the “dominion and property” of lands in colonial America. The court further ruled that since the American Revolution the people held public trust responsibilities for fish and wildlife except for rights specified in the U.S. Constitution. Regarded as the most important confirmation of the principles of public ownership, the signature public trust case was adjudicated in 1892: Illinois Central Railroad v. Illinois, 146 U.S. 387. In this case, the Supreme Court declared that the “sovereign lands” of a state are held in trust by the State for all present and future generations, and that such land may not be sold for development incompatible with uses covered by the Public Trust Doctrine. 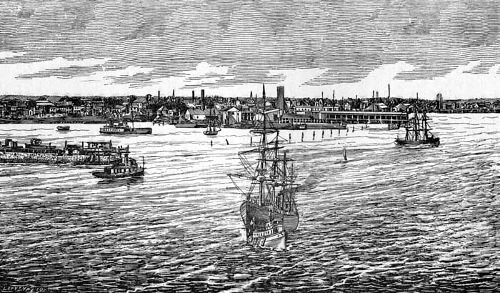 The Illinois legislature had granted large sections of the Chicago harbor—including the bed of Lake Michigan—to the Illinois Central Railroad, which wanted to change use of the land. A succeeding legislature sought to revoke the grant, asserting it should never have been permitted. Parallel yet opposing arguments were debated; (and which offer example of possible conflict between concepts of “public interest” and “public trust”). Could the legislature appropriate the State of its “ownership” of submerged lands, and of the resultant control of those waters? Conversely, could the railroad “hold” these lands and control the waters (through the grant) against future control over them by the state? The court held that the common law Public Trust Doctrine prevented the government from alienating the public right to the lands under navigable waters—except in the case of very small portions of land which would have no effect on free access or navigation—reaffirming that the legislature (an elected body subject to contemporary influence) could not divest the State of the control and management of the harbor and bestow it completely to a private corporation: to do so would be a gross perversion of the trust over the property under which it is held. States do not own tideland resources, but hold them "in trust"
To fulfill this responsibility, these public resources must be maintained, managed, and used in a manner consistent with the use and preservation of public trust benefits, and as such, the doctrine forms the basis of modern fish and wildlife management metrics. Of contemporary developments, the definition of the doctrine has been further refined by the California courts, as providing the public the right to use water resources (additionally) for: commerce, environmental preservation and recreation, as ecological units for scientific study, as open space, as environments which provide food and habitats for birds and marine life; and as environments which favorably affect the aesthetic characteristics (scenery) and climate of the area. Summoning protective measures against actions that would degrade the trust resource (the waterway), the (4th) District Court for Suffolk County, NY “The entire ecological system supporting the waterways is an integral part of them and must necessarily be included within the purview of the trust” (People of Tn. of Smithtown v. Povermo, 71 Misc.2d 524; 1972). In 1983 the California Supreme Court established the effect of the Public Trust Doctrine for consumptive water resources rights in National Audubon Society v. Superior Court of Alpine County, (33 C3rd 419: the “Mono Lake Case”). Plaintiffs contended that the Act amounted to a de facto appropriation (taking) of private properties for public use without compensation, in violation of 5th Amendment Federal and State “due process.” A regulatory taking objection asserts that a (state) regulation over-reaches, by restricting the use of the land, and denying a landowner all economically viable uses. (A “categorical taking” refers to situations when government physically occupies a property, and under the rule of eminent domain this requires fair market value compensation. See also: Nollan v. California Coastal Commission, 483 U.S. 825, 97 L. Ed.2d 677; and Dolan v. City of Tigard, Oregon, 512 U.S. 687 (1994). More recently, the significance of the Public Trust Doctrine can be seen in its application by state and federal administrative and natural resource management agencies that are charged with responsibility for protecting public health, safety, and welfare; and prevention/limiting of flooding, erosion, and water pollution. The doctrine requires state government to exercise its responsibilities to protect the trust when making decisions about allocating resources to private uses: if it fails to do so, this may result in the reversal of a decision, even years later and without mitigation of costs or losses, (Bingham and Gould, 1992). Generally at the forefront of discourse on this issue, California courts have held a requirement to integrate—rather than choose—between the trust, and the state’s (competing or mitigating) “reasonable use doctrine,” for the general public welfare. Changing the definition of "Conservation"
In the North American Model (NAM), wildlife is held in the public trust, considered an “international resource.” Under the model, fish and wildlife are designated as “game” and held by the public through state and federal governments, allocated by law as opposed to market ethics, land ownership, or other status (the “European Model”), across state or province boundaries. The 1842 decision of Martin v. Waddell 842 (41 U.S. 16 Pet. 367 367: see above) established that wildlife in the United States were not owned by individuals but belonged to all the citizens as a principle of “democratic opportunity” exclusive of wealth or social standing. The 1929 Migratory Bird Conservation Act (16 U.S.C. 718-718j, 48 Stat. 452: the “Norbeck-Andresen Act”) created the United States Migratory Bird Conservation Commission (MBCC) to consider and approve any areas of land and/or water recommended by the Secretary of the Interior for purchase or rental by the U.S. Fish and Wildlife Service and to fix the price at which such areas may be purchased or rented. 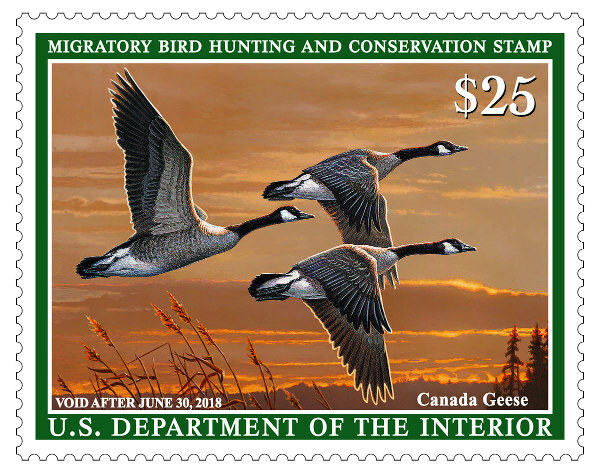 In 1934, the act was amended (the Migratory Bird Hunting and Conservation Stamp Act, or, the “Duck Stamp Act,” requires each waterfowl hunter 16 years of age or older to possess a valid Federal hunting stamp (IV: “Hunting and Conservation Stamp Tax”). As an example, in August of 2017 the US Secretary of the Interior announced distribution of $1.1 billion in annual funding for state wildlife agencies from revenues generated by the Pittman Act and the Dingell-Johnson Sport Fish Restoration Act, through which Connecticut will receive $3,494,429 through the Sport Fish Restoration Fund and $5,702,335 through the Wildlife Restoration Fund: giving the state a total amount of $9,196,764 in the current fiscal year. Hunting advocacy propaganda is generally centered on this definition of “conservation,” wherein populations of target species are “managed” such that they are permanently available at “sustainable” population levels for use by hunters. Today, expansion of recreational hunting opportunities rests most significantly on an economic model that is focused on employment and tax revenue, and as such, is difficult for legislators to successfully oppose. “Management” in this instance may mean culling populations of animals deemed a nuisance (examples: raccoons, beavers, deer, etc. in sub-urban areas: in which their definition is changed to “vermin”), or, culling predators of animals that prey on target species, or are otherwise those that hunters want to kill themselves. Animal welfare advocates contend that such ethics are inadequate, and question whether the North America Model is inclusive of all wildlife conservation interests rather than geared toward a single group of sportsmen stakeholders. They argue that the model is exclusive in its application, relying on narrow definitions of history and ethics that give disproportionate credit to recreational and trophy hunting as a primary factor in rebuilding wildlife populations, thereby favoring sportsmen and dependent government agencies over the interest of the public-at-large. For example, the 5th “Seven Sisters pillar” that would define non-frivolous use (killing) has been broadly interpreted to now include food, fur, self-defense, and protection of property. In Connecticut, the model is used to craft an ill-defined and publicly misunderstood concept of “conservation,” that is steeped in hypocrisy, in order to overcome public opposition toward carefully scripted expansion of recreational hunting into public properties. Pursuant to the NAM, the Wildlife division of the state's Dept. of Energy and Environment (DEEP) derives it's funding from and works on behalf of its constituent hunters, even to the extents that as a public relations tenet, it encourages members to buy licenses even when they no longer hunt, has focused on programs to encourage youth hunting (to replace dwindling hunter participation), and— ignoring the traditional role of impartiality ordinarily expected of government agencies— actively and aggressively participated in legislative effort to expand hunting into public areas. Justinian I or Justinian the Great (Flavius Petrus Sabbatius Iustinianus; Greek: Φλάβιος Πέτρος Σαββάτιος Ιουστινιανός), AD 483 – 13 or 14 November 565, the second member of the “Justinian Dynasty” (after his uncle, Justin I) was Eastern Roman Emperor from 527 until his death. Amongst Eastern Orthodox Christians, Justinian I is considered a saint, and is commemorated by some Lutheran Churches. One of the most important figures of “Late Antiquity” (300 – 600 AD), the influence of his administration extended far beyond the margins of his time and empire. Justinian's reign is marked by the grand (ultimately failed) restoration of the empire (renovatio imperii). This ambition was expressed in the partial recovery of the territories of the western Roman empire, including the city of Rome itself. A more significant aspect of his legacy was the uniform rewriting of Roman law, (the Corpus Juris Civilis) accomplished in three drafts: a codification of imperial constitutions from the 2nd century onward (529- 534); an anthology of older legal texts (533); and a primer explaining the principles of law (534). Finally, a supplement defining a collection of new laws issued during Justinian's reign was added. The Corpus became the basis of Latin jurisprudence, including ecclesiastical “canon law” (the legal system of the Catholic Church), and represents several sources in which the laws and rules were expressed or published: (proper laws, senatorial consults, imperial decrees, case law, and jurist opinions and interpretations. The code ensured the survival of Roman law: it formed the basis of later Byzantine law, was introduced in Italy (554) from where it was to pass to Western Europe in the 12th century; and become the basis of European law code. The Corpus is still influential to this day. Common law refers to the system of law originating in England, as distinct from the civil or Roman law and the canon or ecclesiastical law. It is the unwritten law, based on custom or court decision, and so, differentiated from statute law. In this, common law is the law developed by precedent administered through the system of courts established for the purpose, as distinct from equity or admiralty. See also: page 1 endnotes. 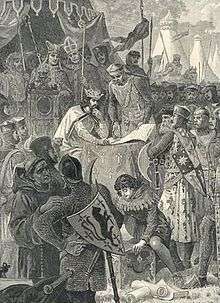 King John forced to sign the "Great Charter"
 Magna Carta, (Magna Carta Libertatum, or the “Great Charter of Freedoms”), is an English legal charter, written in Latin, originally issued in 1215 (amended in later years, with the 1297 version remaining today on the statute books of England and Wales). Magna Carta required King John of England (1199 – 1216) to proclaim certain rights (related to nobles), respect certain legal procedures, and acknowledge that his will could be compelled by the law. Magna Carta is regarded as the most significant early influence on the extensive historical process that led to the rule of constitutional law (the basic laws that form the foundation of a government) today in the English speaking world. It induced the maturing of common law (see above), and the United States Constitution. An extended and complicating factor is that granted and un-granted lands may already have been developed for certain trust uses that are incompatible with other trust uses, or may have become archaic. An example would be tidelands that were dedicated exclusively to industrial port uses, in which recreational uses (even if also authorized by the trust grant), may be irreconcilable. Piers, wharves and warehouses that once served commercial navigation but which are now incompatible with modern container shipping protocols would suggest conversion to a more productive trust use. And later two acts of congress: the Weeks–McLean Act (the Migratory Bird Act of 1913) prohibited the spring hunting and marketing of migratory birds and the importation of wild bird feathers for women’s fashion (deemed: “millinery murder”). The first US law to regulate shooting of migratory birds, the Act gave the Secretary of Agriculture power to establish hunting seasons nationwide. Because migratory birds naturally crossed state and international borders freely, Congress had previously established that regulating their harvest fell under federal purview. However, owing to constitutional limitations it was replaced by the Migratory Bird Treaty Act of 1918, (39 Stat. 1702, T.S. No. 628; 16 USC §703), flowing from two Supreme Court rulings (the first ruled the 1913 Act unconstitutional and the second, Missouri v. Holland, 252 U.S. 416, , upheld the 1918 Act as a use of the federal “Congressional Treaty Power” to override the provisions of state law that would ordinarily preserve a state's “quasi-sovereign right”). The Public Trust Doctrine was thereby confirmed as a basis of federal responsibility for directing the “conservation” and “management” of migratory birds, and incorporating such into international treaties, as a reflection of Article VI of the US Constitution: the “Supremacy Clause,” dictating that federal treaty-making authority could not be subject to state scrutiny; (for a modern-day interpretation, see: discussion above, The North American Model) . Bray, Paul M., The Public Trust Doctrine, Government Law Center, Albany Law School, 80 New Scotland Ave., Albany, New York 12208. Duties of Trustees. In locales where it applies, the Public Trust Doctrine creates a duty of administrative (supervisory) control over the waters of navigable streams, their non-navigable tributaries, and fishery and wildlife resources. As discussed in earlier pages of this essay, trust purposes and obligations have been extended to land resources. Though these waters are broadly appropriated for drinking, industrial, agricultural supply, or other regulatory uses, the doctrine requires that harm to trust purposes be prevented or minimized whenever feasible. Water rights or other regulatory approvals for private uses cannot be vested in a manner harmful to these purposes, and no private uses are grandfathered against continuing supervision. In the “Mono Lake” case, (National Audubon Society v. Superior Court of Alpine County: see above), The California State Water Resources Control Board (SWRCB) had unconditionally granted appropriation rights of all flows of the non-navigable tributaries to Mono Lake (a terminal “salt lake” on the eastern slope of the Sierra Nevada in CA) to the City of Los Angeles Department of Water and Power’s (LADWP) in 1941. The SWRCB based its granting of these rights on its interpretation that the California Water Code did not authorize any mitigation of foreseeable harm to environmental quality. However, after 42 years of exploitation, the water quality and level of the lake had declined to an extent that invertebrate, migratory waterfowl, and fish habitats in tributary streams had suffered immensely, becoming “dry washes.” Fearing further loss, in 1979, the National Audubon Society, Friends of the Earth, the Sierra Club, and the Mono Lake Committee sued the city to halt the export of water: citing stipulations of the public trust doctrine to prevent undue impact on migratory and nesting bird populations. In 1983 (see: above), the California Supreme Court held that LADWP’s rights remained subject to review and amendment under fiduciary charge of the doctrine. The court mandated that the SWRCB undertake an objective review to determine whether the trust purposes of the lake and tributaries could be restored and protected; and if such restoration would harmonize with LADWP’s legitimate need to provide water supply. Later, the SWRCB determined it was necessary to reduce LADWP’s water diversions from the lake tributaries by 75%, in order to raise and maintain the lake to a level sufficient to protect waterfowl and other affected species. Numerous court cases followed for more than a decade, as the antagonists debated the extent and nature of Los Angeles’s water rights. Meanwhile, the water level in the lake continued to drop, and riparian/aquatic habitats remained unrestored. The LADWP estimated that it had spent nearly $12 million on legal and consultancy fees by 1991. In 1994, the state halted any further withdrawal of stream water from the Mono Basin for 20 years: presumably until the lake reached a targeted level. The LADWP estimated the value of the lost water and hydroelectric power to be nearly $36 million annually, with the costs borne by Los Angeles. Yet by 2008, the court-stipulated level still had not been reached. The ruling invigorated advocacy groups to move aggressively to extend the public trust to other areas and uses. Ozzy: the very nearly "Invisible Man"
Around the turn of the 19th century, a warm attitude toward dogs spread through all classes of society. 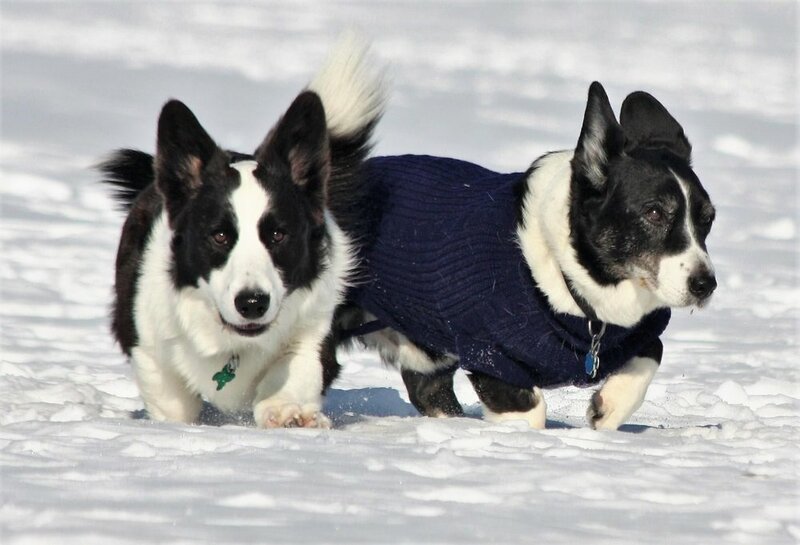 Although dogs continued to perform essential economic functions, they were now thought of primarily as companions. It became generally acceptable to express deep affections for one’s dog and to glorify the virtues of the whole species, sometimes with a sentimentality that would have been dismissed as absurd in earlier periods. Robert Southey’s “On the Death of a Favorite Spaniel” (1796) illustrates the new non-utilitarian view of dogs. Phillis’s sight and hearing were dim; she was certainly no use in the field or, one might argue, anywhere else. So while Southey was away, leaving no one to plead “For the old age of brute fidelity,” she was drowned. This was the traditional practice for superannuated dogs, yet Sothey protests it as he would similar treatment of a person. Had he been home, he would have pleaded earnestly for her, for he remembers her from his boyhood. Still, though he deploys her execution, he consoles himself with the assurance that she has gone to a better world. I felt from thy dumb welcome. Jackson: "How long do I have to 'stay'?" Feeling myself changed too, and musing much on many a sad vicissitude of life! for the old age of brute fidelity! the mystery of life to be the sport of merciless man! There is another world for all that live and move— a better one!